A week ago we were in Plymouth, Massachusetts -- today we're across the pond in Plymouth, Devonshire, to help kick off the countdown to the 400th anniversary of the sailing of the Mayflower. We've posted a few pictures of our trip on Instagram (www.instagram.com/james_nevius) and more will be forthcoming as we sort through them. Have a look! We hope everyone is having a wonderful Thanksgiving. 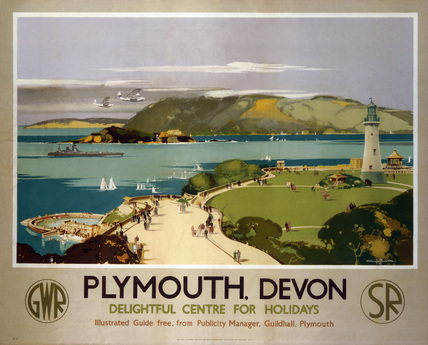 Postcard Thursday: Greetings from Plymouth! Greetings from Massachusetts. 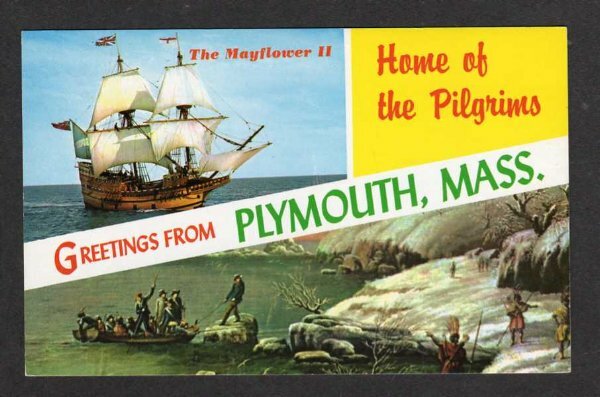 As some of you may know, we are off on an adventure tracing the path of the Pilgrims and the Mayflower...in reverse, from Plymouth (Mass.) to Plymouth (UK) to Leiden in Holland. This is primary research for what James hopes will be a new book about the intersections of history, memory, genealogy, and more. Today's card shows the so-called "Council Chamber" -- really the parlor -- of the Morris-Jumel Mansion in Washington Heights. The country house, built in 1765 by Roger Morris, served briefly as George Washington's headquarters during the Revolutionary War. Later, after the British re-took New York, it was used by British general Henry Clinton. 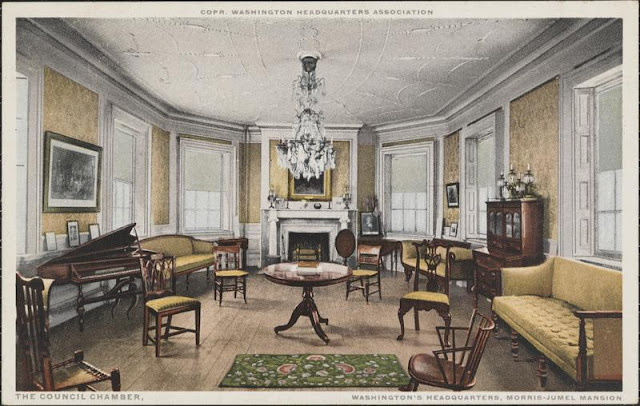 The postcard was issued when the site was run by the Washington Headquarters Association, which placed great emphasis on the home's limited role in the Revolution. The Morrises, staunch loyalists, had the house taken from them by the fledgling American government after the war. It served as a tavern before being purchased by Stephen and Eliza Jumel in 1806. After Stephen's death, Eliza Jumel married the former vice president, Aaron Burr. Ironically, there are only two great country homes left in this part of Manhattan: Burr's and that of his rival, Alexander Hamilton, whose home "The Grange" is now run by the National Park Service. Hamilton is, of course, the subject of a blockbuster Broadway musical. This lovely view of the Bridle Path in Central Park, mailed in 1908, shows one of the few bridges and arches in the park that has been demolished. Called the Spur Rock Arch, it stood where today's Hecksher Playground was later built. On its face, Vaux and Olmsted’s traffic plan seems eminently practical, but there was more than simple engineering afoot. Since only the wealthiest New Yorkers could afford a carriage or the luxury of horseback riding, the Drive and the Ride were de facto upper-class thoroughfares. 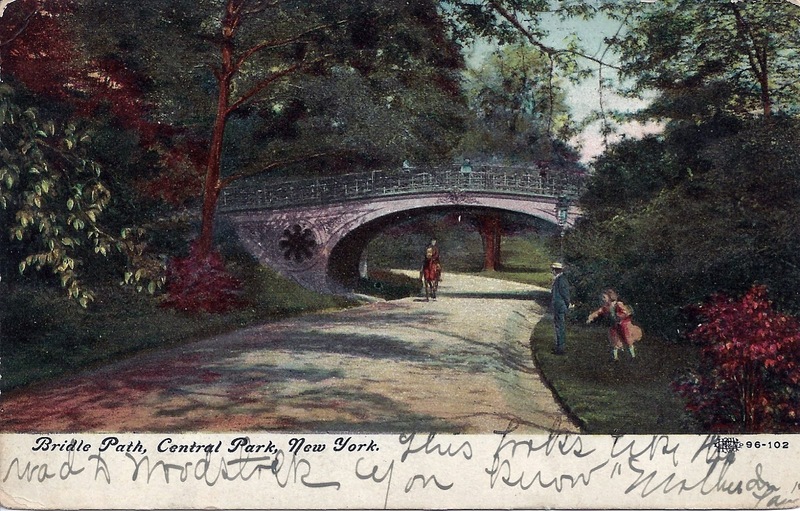 In most places, they were kept at a safe remove from the working-class Walk, though some- times the Drive was paralleled by walking paths, presumably so that poorer New Yorkers could see what they were missing—and so that the rich could set a good example. The distinctive oval outline of its archway and the S-curve sides were repeated later with different dimensions for Gothic Bridge. The ornament of the spandrels was altogether different although both designs stemmed from the Gothic, with Spur Rock's spandrels filled and braced by large wheels with interior cusping, not unlike some church windows. The supporting members were wrought iron; the more finely drawn decorative members were cast iron. Spur Rock was demolished because it got in the way of the expansion of the Heckscher Playground. Instead of being incorporated into the playground, Spur Rock, probably looking old-fashioned, rundown and unimportant in 1934, was destroyed.